I would not necessarily come to those conclusions regarding Honda's range matching that of BMW, and of linear vs. not. BMW's are notoriously designed to run very hot, for the sake of emissions and fuel economy, at the expense of living on the edge of engine failure at all times. So BMW is "out there," hopefully Honda dialed it back a little. And regarding assuming anything is linear, I don't know. For the BMW, it is a programmed mapping that is probably piecewise linear, but who knows how many segments Honda used, or even if they use a similar approach. I just tend to be skeptical and careful about believing things - could be true. Maybe even probably close to true, but safer to count on what you know. "My guess is that dealers don't want to waste their time and burn up their reputations in front of ill-informed clients by refusing to fix non-existent problems with the temperature gauge that are really harmless fluctuations within the normal range. The downside, of course, is that people who actually have the knowledge and ability to interpret the information properly are by default not trusted to receive it." But if this is all true, as I expect it is, it is actually another reason to not be so concerned with the temp gauge. Not to rely on it, either way. If S-VCM can do what it says it does, maybe it could actually adjust the signal to amplify the overheating signal when it is detected. I think the better way would be to deal with the gauge separately from the ECM, but since it's already right there, detecting temp and adjusting itself when it detects an overheated condition, it could perhaps also then de-map the condensed Honda gauge mapping. ... 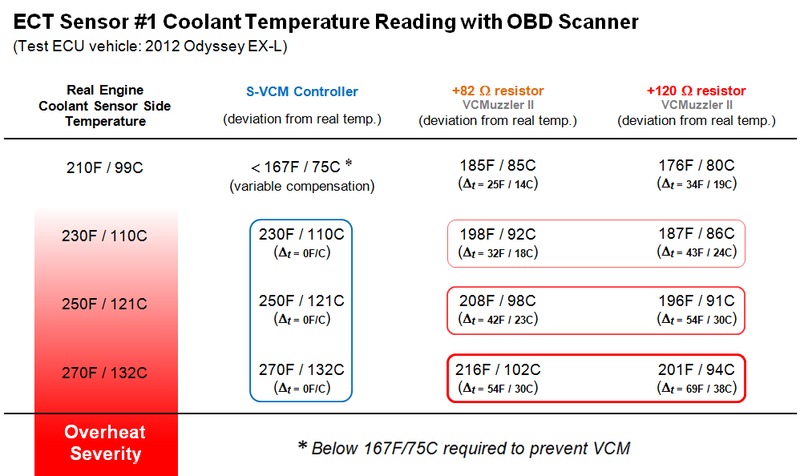 So, with the resistor based devices the best warning that cooling is not up to par might be if the driver noticed a lot of VCM activation. You know, that's probably right. With a muzzling resistor in there, the ECO light becomes your overheating warning light, which would actually be a much better indicator than having a needle move a millimeter or so. When the ECO light never ever comes on, it gets your attention if it ever does. I only had my ECO light come on one time after installing my resistor a few years ago. I had carried about 1200 pounds of drywall up a mountain (a few thousand feet in the Sierra Nevada) in the middle of the summer. Taking it easy, no problems, then after cresting the hill and gradually starting heading down the other side the light came on a little bit. The engine was probably well heated up due to the summer heat and heavy load, up a mountain, but revs were up while climbing, so the coolant was being cooled. Also, needing to climb the hill, engine load requirements would not want VCM to activate. After cresting the hill, coasting, revs dropped, so the coolant was not circulating so much, yet the built up heat was still there, temps probably rose, and also, coasting, the VCM jumped at the chance to activate itself. It was on for less than a minute, and I have not seen it since. This all made sense, so I was happy to see it, confirming the ECO is still there ready to go. But now I will also watch for it as an overheat warning. Last edited by oldskewel; 10-05-2018 at 04:11 PM. I swear the pic was up there. Crushed to see it wiped out. Probably brought it upon myself with the too-early celebration. I'll try again, except this time I'll say that it probably won't work, and if it does not, it's my own user error, and certainly has nothing to do with OdyClub.com being anything less than perfection. ECO as an over heat light will only work if you are not deep in the throttle. My eco light only came on when under light load. Which is unlikely to be the case when heavily loaded. Just because you see the ECO light with a Muzzler does NOT mean the engine is overheating. Everyone is way over-analyzing this and it's getting the point of ridiculous. Engine temps vary with so many things and it's not "overheating" until you get into the 220F range and above. Everything else is within normal range, just on the high end of a normal range. Keep your cooling system maintained (proper coolant, coolant changes, thermostat and water pump maintenance) and you will not have a problem. I agree, I would not bail out of the car if I saw the ECO light. But for a resistored ECT sensor, an ECO light coming on does correctly bring attention to the temp rising above its normal range. Certainly it does that in my car. And if anything can be gained after that from watching the temp gauge with a magnifying glass, it might be helpful. I installed the S-VCM on my 2012 Ody TE and took it on a 1100 mile trip over the holidays. I installed the controller when the engine was cold, and never saw a CEL or other issue. The temp gauge appearance is imperceptible. I have not seen a ECO light since-and like it. The VCM shudder was noticeable and annoying, and now that I have all 6 cylinders online it's smooth. My Ody has 89K miles, so hopefully not too much damage. The fuel economy went down about 1-1.5MPG, but I'm fine with that. I have a 2016 Odyssey and the VCM works seamlessly on this vehicle - its operation is virtually undetectable. The VCM activation in earlier years is clearly detectable per forum discussion, and may operate differently. I have a vacuum gauge on the dash. That gauge tells me exactly when the VCM is active, because the vacuum drops way down relative to the mpg and throttle position when VCM is active. The ECO light will be on when the mileage is about 25 mpg or better, no matter if VCM is active or not. The VCM system activates when the mileage is over about 30 mpg for a short period of time. VCM then cuts out immediately when the mileage drops below about 30 mpg. The ECO light is not a VCM on/off indicator, nor is it an overheat light. The ECO light can be on or off when VCM is not engaged. At higher speeds, VCM is usually off. The ECO light will always be on if VCM is engaged. If the ECO light is off, VCM will always be disengaged. VCM is more likely to be active a greater percentage of time if cruise control is engaged. The ECO light is not an indication of high engine temperature. The engine temperature needs to be above perhaps 165 degrees before the ECO light becomes functional. It is that temperature sensing that is raised with these muzzlers. Depending on the muzzler setting, the ECO light will be disabled at normal operating temperatures. If the ECO light is off, VCM is disabled. Mileage will be affected only because VCM is disabled and inactive, otherwise it will be independent of the (now disabled) ECO light. That's about it. I know these things because I have a combination of a vacuum gauge and a ScanGauge installed, and these devices tell me so. The ScanGauge reads actual water temperature, the temperature gauge on the dash gauge does not. The temperature gauge is only a general indication of engine temperature and is always steady during normal engine temps. The temperature gauge remains steady while the engine temperature can vary at least 30 degrees as driving conditions change. As the engine actually begins to overheat, like when the radiator cap is loose and it's hot out and the engine begins to boil over, the temperature gauge rapidly goes full hot, if you are lucky enough to be watching when this happens, that is. What's needed is an overheat light and buzzer, not a temperature gauge. If you want to see what your engine is really doing moment by moment, a vacuum gauge is a primary indicator of throttle position (which you feel) and fuel consumption (which you don't feel). A ScanGauge fills in the blanks. By the way, VCM adds maybe 10% or 12% to mileage, but only while it is active. If you want to save gas, you can accelerate and then coast, you can coast to a stop as soon as a light turns red, and you can coast during downhill runs, which is a different topic. Last edited by riverman; 01-03-2019 at 06:31 AM. I recently learned about the issues with VCM, and even though my 2007 Touring has over 130K miles and I haven't had any symptoms (no oil consumption issues and spark plugs looked fine when I changed them 25K miles ago), I'm still considering deactivating VCM as an insurance policy. I like the idea of the S-VCM with the install and forget (don't need to adjust resistance) and that if the temperature gets too hot it reflects on the temperature gauge. For those that have installed the S-VCM, is it still working well and are you still happy with it? Take a look at the VCMTunerII. It is similar to the S-VCM but has added features that make it much easier to do diagnostics, coolant flushes, idle relearns, etc. It has an accelerometer that can sense when the vehicle is sitting stationary and after two minutes will indicate the actual temp, allowing the idle relearn to complete. Having actual temps displayed when bleeding the cooling system is very helpful. I'm running the VCMTunerII and I love it. Thanks, I'll take a look at this as well. We've racked up about 12,000 km (about 7,500 miles) since the initial install this past summer and still going strong. ECO indicator has not lit up once and the other vehicle performance characteristics I had with the VCMuzzler (smoothness, responsiveness, power, fuel economy, oil non-consumption) remain unchanged. It is also holding up very well in the underhood environment. I gently spray down everything in the engine bay while I'm at the car wash roughly every other month so things are very clean where our S-VCM lives, but it has also been good and wet more than once and we haven't had a single problem or issue. S-VCM remains full value for the money in our case. Last edited by CroMath; 01-08-2019 at 03:13 PM. Reason: Shameless ego stroking. Yes S-VCM is still ticking along fine. I do unplug and plug it back in to test. Did it this past weekend to verify coolant temps and to properly let the fuel trims at idle be set. Would be nice to have the ability to bypass the unit like the newer VCMTunerII. I installed a fuse online with my svcm. Pull the fuse and it is disabled and the van still gets readings from the temp sending unit. You could easily put it on a toggle switch in the vehicle. Not sure what you mean by "let the fuel trims at idle be set." Fuel trims are constantly changing and being adjusted by the PCM. They are never "set." One issue with just removing the fuse and leaving the SVCM plugged in is there is still some resistance in the internal transistor that does the switching. You are never really getting the real coolant temp with the module still connected in the system with just the fuse removed. It's not 82 ohms or anything but it's not zero either. That's what makes the VCMTuner so nice. No need to unplug the unit (and possibly setting a P0118 code) just to get an accurate temp while testing after coolant change, idle relearn, etc.